Buckling of Columns is a form of deformation as a result of axial- compression forces. This leads to bending of the column, due to the instability of the column. This mode of failure is quick, and hence dangerous. Length, strength and other factors determine how or if a column will buckle. Long columns compared to their thickness will experience elastic buckling similar to bending a spaghetti noodle. This will occur at stress level less than the ultimate stress of the column. The Euler equation, euller’s explains this phenomena. The ‘L’ in this equation symbolizes length and ‘P’ symbolizes the allowable load before buckle. As the length increases, the allowable load decreases. With shorter columns compared to its thickness, one can infer from the same equation above that the allowable stress on a column before buckling increases as length decreases. The type of end connections for the column is another important factor in determining buckling stress. From pinned-pinned to fixed-fixed to fixed-pinned connection, they are each represented in the Euler equation with different values of ‘n.’ The fixed-fixed connection increases the allowable stress before buckling more than any of the other end connections. In construction, it occurs differently for different materials. This factor of material is captured in the Euler’s equation with ‘E” and ‘I,’ different material properties. In steel columns, this occurs elastically. This differs for reinforced concrete. 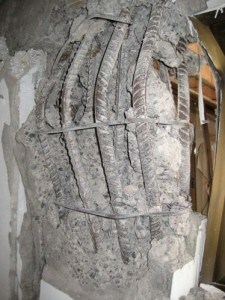 In the image below, the steel rebar is bent outward and the concrete is broken apart. With a more brittle material, the phenomenon is more sudden.